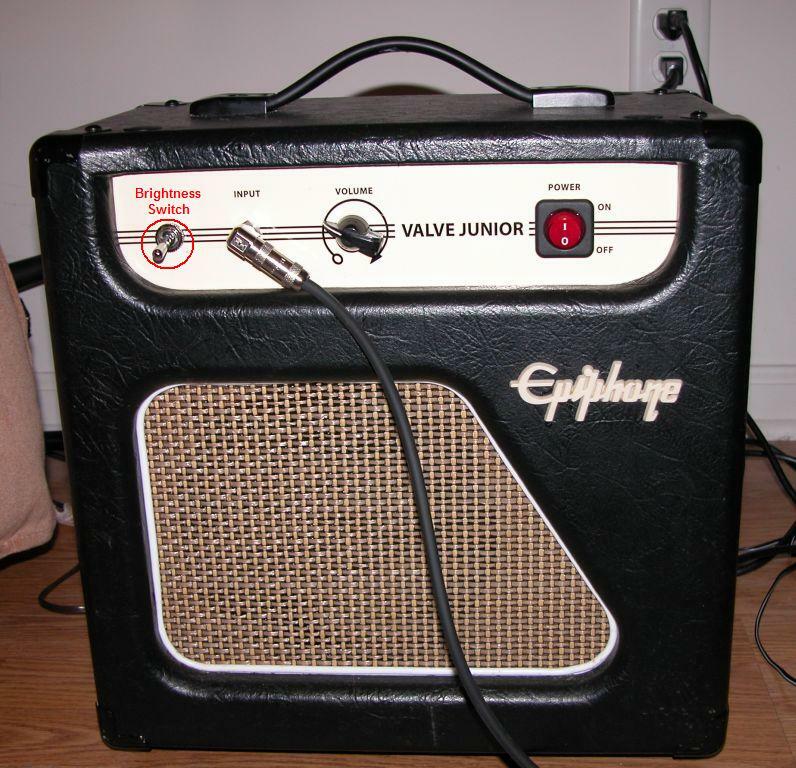 The following content is intended as reference information for DO-IT-YOURSELF modifications to the Epiphone Valve Junior amplifier. I do not perform these modifications as a service and I have no affiliation whatsoever with Voodoo Amplification, so please don't bother those nice folks by trying to contact me there! There's an e-mail contact link for me at the bottom of this page. The modifications described below are specific to the original "version 1" Valve Junior combo amp. They do not apply to any head version of the Valve Junior, or to combo versions 2 and later. If your combo VJr amp has more than a single output jack on the back, it's not version 1! WARNING!! The following webpage deals with making electrical modifications to a guitar amplifier. Be forewarned that there are potentially LETHAL voltages within these amps, even when unplugged! 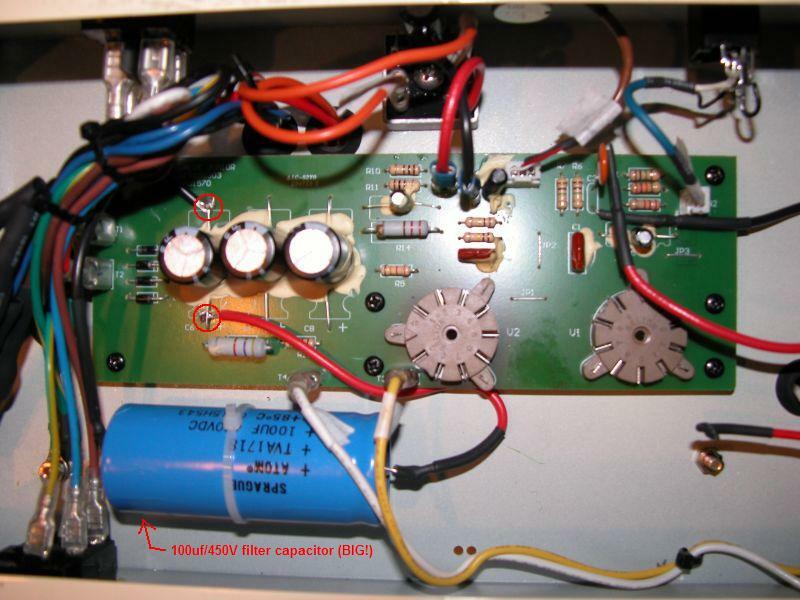 Filter capacitors should be fully discharged before working inside the amp to avoid the possibility of a serious or even FATAL shock (the method I use is available HERE.) If you aren't confident of your capability to perform this work safely, take the amp to a qualified technician. I accept no liability for mishaps arising from failure to heed this warning! 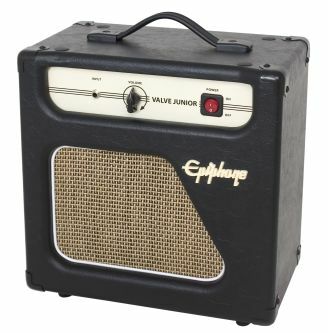 The 5W Epiphone Valve Junior has certainly created a stir among devotees of tube-based guitar amplifiers. This little gem has quickly established a cult following, since it offers genuine class A tube amp vibe for a ridiculously low price ($140 for the combo, $100 for the newer head model). And you can pick up used examples of the combo version in good condition on eBay for well under $100 (I got mine for $92). A second shortcoming that I noticed in my VJr was a rather dull tone, lacking "top end". I found myself maxing out the treble tone controls on all of my guitars when I played though it. Though the mod sites listed above tended to go after the hum issues as the primary improvement need, all of them made changes that boosted the amp's top end to some extent, as well, so I was obviously not alone in my opinion. Since I don't often crank the volume up into the range where the buzzy hum gets really bad, I actually considered this need for more brightness to be my first priority. I swapped the stock Sovtek tubes for JJ's from Eurotubes.com, and though the amp's tone improved and brightened slightly, the improvement was nowhere near what I was looking for. In addition to the above two issues, a number of other mods were described at these various websites, mostly falling into the category of enhancements to the VJr's intentionally sparse feature set. These included things like adding a high gain switch, an additional 8 ohm output jack, or installing a small light bulb to act as a signal attenuator. However, I had no personal need for or interest in any of these, and opted to pass on implementing them. 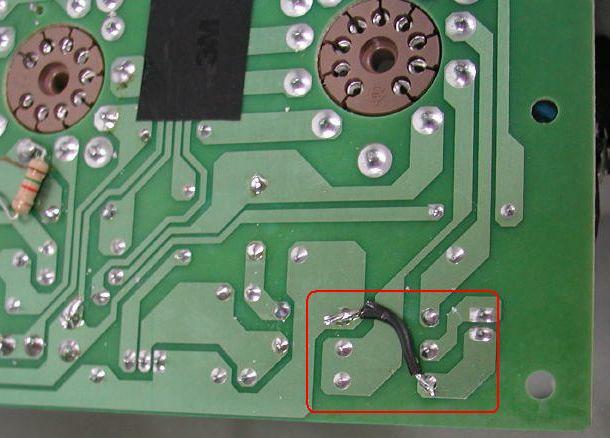 Improve grounding on the PCB by adding a jumper wire between two of the traces. This corrects a grounding design deficiency. Replace the stock input jack with a nylon insulated jack, to isolate it from the chassis. Add a larger filtering capacitor (100uf/450V) to the main high voltage supply stage, to supplement the smaller stock caps. 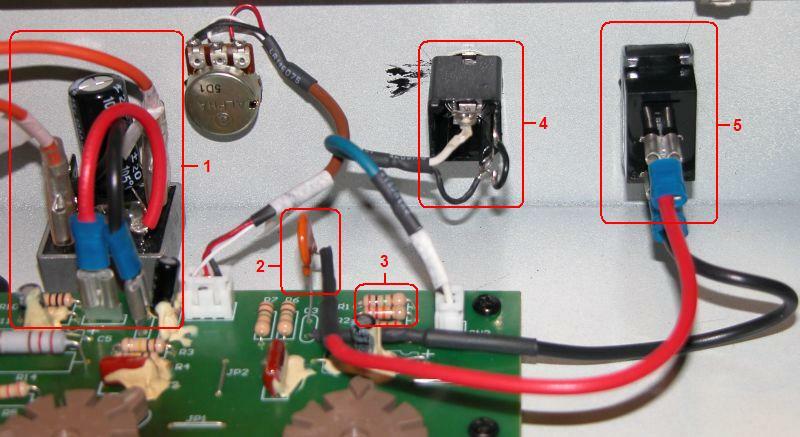 Convert the voltage supply to the tube heater filaments from AC to DC, requiring the addition of a small bridge rectifier and 1000uf/25V capacitor. Boost the amount of input signal going to the preamp stage and reduce the signal bleed to ground by changing two resistors on the PCB. Specifically, R1 is increased to 1M and R2 is lowered to 22K. These resistor changes also cause a net increase in the input impedance of the amp, which has the effect of boosting the highs a bit. Add a switchable tone capacitor to an open position on the PCB (C3), i.e. install a "brightness switch". Once I decided what to do, the next task was to accumulate the parts I needed. The expert's links above gave me the basics of what I needed, but being totally inexperienced in electronics, knowing exactly what to get and where to get it was more of a challenge. After running around to a couple of local stores in search of these components and having very little luck, I ended up ordering everything online from Mouser.com. Not only do these guys have pretty much every electrical component known to mankind, but they also don't have a minimum order size, which is a nice plus! To make it easier for any of you amateur modders who want to give this stuff a try, HERE is a copy of my VJr mod "bill of materials" in PDF format. It includes all the Mouser and manufacturer part numbers to make ordering easy. Note that I bought three different tone capacitor sizes, plus a couple of extra resistors to have on hand. The total before shipping came to a bit over $22. Cheap! Once the parts arrived, I got down to the business of installing them. Let me say right up front that I had help. Yours truly has never soldered a thing in his life, and this didn't seem like a good time to learn. Fortunately, we have a couple of very accomplished electronics techs where I work, and they were good enough to help me out during a couple of my lunch hours. With their able assistance, the six modifications described above were completed in short order. I should mention that in the course of installing these six mods, it was necessary to drill two new holes through the amp's metal chassis. One was a small hole through the bottom to accomodate the mounting bolt for the bridge rectifier, and a second, larger hole was required in the front panel for the new brightness toggle switch. The bridge rectifier and 1000uf/25V capacitor. The orange wires formerly connected to terminals T5 and T6 on the PCB, but now connect to the rectifier, whose + and - terminals now connect to those board terminals. The capacitor is soldered across the + and - terminals of the rectifier. IMPORTANT: These electrolytic caps are polar, so the positive side must go to the positive terminal of the rectifier, and the negative side to the negative terminal. If wired backwards, they can literally explode when energized! Ceramic 68pf tone capacitor, soldered to one of the two open C3 terminals on the PCB (ceramic caps are not polar, so it doesn't matter which end is soldered to the PCB). The other end is wired to the toggle switch in the panel face (#5), and the other side of the switch is wired back to the second C3 terminal. The two new resistors (R1 = 1M and R2 = 22K) that were substituted for the stock resistors. The back of the new nylon insulated input jack. The back of the "brightness switch" toggle. Here's a different view of the PCB, showing the big 100uf/450V filter capacitor, which is wired in parallel with the smaller filter caps on the board. The connection points are circled in red. The capacitor is lashed down to the chassis with a wire tie fastened to an adhesive anchor pad. Again, you MUST pay attention to the capacitor's polarity when making these connections! Bridge rectifier installation - Because the AC to DC conversion generates heat, the experts strongly suggest that the rectifier be bolted firmly to the chassis to facilitate cooling by heat transfer. I went a step further by smearing a little thermal paste on the bottom of the rectifier block, to give better surface contact. The connections to the rectifier are pretty easy to figure out, but I've posted a diagram I found online HERE, for reference. Tone caps - Because I'd read comments that lead me to believe that a 50pf cap might give too little brightness boost and a 100pf cap too much, I opted to install the 68pf cap. But I bought one of each size so that I could go bigger or smaller, depending upon how the 68pf cap sounded to me. Nylon insulated input jack - In addition to soldering the hot and ground leads to the jack's tip and sleeve terminals, respectively, we also soldered a short jumper between the sleeve and tip shunt terminals. The original input jack was wired this way, so I did the same thing with the new one. Don't know if it's really necessary, but it seems to work fine. HERE is a diagram that shows the terminal layout of the Switchcraft N112A input jack. And what did this all accomplish, you ask? Well, a whole bunch, actually. The ambient hum is completely gone, to my ear. The volume-dependent buzz is much reduced, and far less "buzzy" in character now. More of a true hum, and no worse than I get with my Peavey Delta Blues cranked up. I don't even really notice it until the volume is at 3/4, and I rarely play there, anyway! So the four hum fixes have definitely done their job. As for brightening the tone, mission accomplished there, too. The resistor changes made a difference, and the new brightness switch takes it the rest of the way there. With the switch on to engage the tone cap, the top-end brightens up nicely. Makes a noticeable difference with both single poles & humbuckers. I like it so much I'll probably just leave it "on" most of the time. And if I ever decide I'd like a bit more brightness, I can always go back into the amp and replace the 68pf tone cap with a 100pf version. Tone Cap Update: Since the original modifications were done, I've changed from the 68pf tone cap to a 100pf cap, mostly out of curiosity to hear how big a difference it would make. As expected, the brightness increase heard when flipping the toggle on is more pronounced, but not excessively so, in my opinion. Personally, I like having a little more high end on tap, and it's easy enough to roll off the treble knobs on the guitar if it sounds a little too bright in a given situation. I've posted new comparison audio clips for both my Strat and my Les Paul. As before, the brightness switch is off for the first riff, and on for the second. So there you have it, folks. If you have any questions, feel free to drop me a line by e-mail, per the address link below. And if you're contemplating trying some of these mods on your own Valve Junior, just keep this in mind--if an electronics ignoramus like me can do it (with some soldering help! ), anyone can! Just take the proper precautions to work safely around these high voltage components! Good luck & be careful!! Speaker Upgrade - Though the stock speaker was by no means bad, I wanted to get a bit more sparkle and clarity than it offered. I swapped in a Jensen C8R that I picked up at TubeDepot.com for a mere $28. It gives the VJr a nice Fendery top-end that really makes clean single coil tones come alive. Get a small 2-position SPDT toggle switch and mount it on the rear of the VJr chassis, next to the speaker output jack. Then fish out the 8-ohm output wire from the tied back wire bundle of the OT (it's the red one) and solder it to one of the two outside lugs of the toggle switch. Disconnect the 4 ohm output (the brown OT wire) from the output jack and solder it to the other outside lug of the toggle. Then run a wire from the switch's middle lug to where the 4 ohm wire was previously connected on the output jack. Voila! You can now switch the output impedance between 4 and 8 ohms, and use the Valve Junior with an 8 ohm speaker cabinet. Very handy when you want a bigger sound than the onboard 8" speaker can deliver! Output Transformer Upgrade - This was the last upgrade I performed, and it put the tonal icing on the Valve Junior cake for me. The stock output transformer is not only quite small, but it's nominal 7.5K impedance doesn't really match up with the EL-84 power tube, which is designed for 5K. This results in somewhat lower output and non-optimal frequency response, from what I've read. I opted to replace it with a Hammond 125ESE (available at RadioDaze.com for about $37 plus shipping). Though this 15W OT appears to be vastly overrated for the VJr, the extra power capability translates to smoother highs, deeper, punchier bass, and better overall clarity. And it's only a few bucks more expensive than the lower rated models. The physical swap is quite straightforward, and the only mod to the chassis is to drill another hole in the top to mount the 125ESE, due to its larger footprint. A little more expensive than the other mods I did, but definitely a nice improvement to tone and clarity! If you want to undertake this upgrade, there is a great set of directions posted in THIS PDF document, on page 12. Bob Matthews, a.k.a. "Duh Voodoo Man"
And please visit Duh Voodoo Man's HOME PAGE!